The computer system is a collection of different hardware components. So we need software that could perform the basic tasks such as recognizing input from the input devices, sending output to the output devices, keeping tracks of files and directories on the disk and control computer peripheral devices like mouse, printer, scanners etc. An OS is a collection of system program that controls the operations of the computer system. It activates and recognizes the hardware devices and provides the operating environment for other application software. It acts as the intermediary between a user and the computer hardware. It has major two objectives, first is to activate the hardware devices and other is to provide an interactive interface to the user and interpret commands so that it can communicate with the hardware. Example UNIX, MS-DOS, MS-Windows, Linux etc. 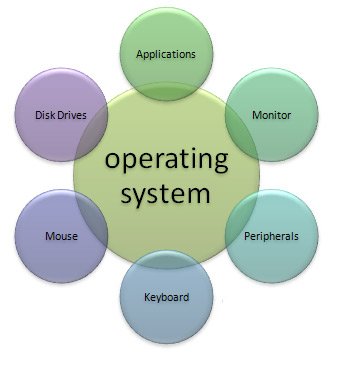 Operating system are categorized into different types on the basis of mode of use and user. Single user operating system: This is the type of computer system which is mostly used in desktop and laptop. It generally provides a simple computer system, which facilitates the running of a variety of software packages as well as it allows users to develop and execute programs of their own. 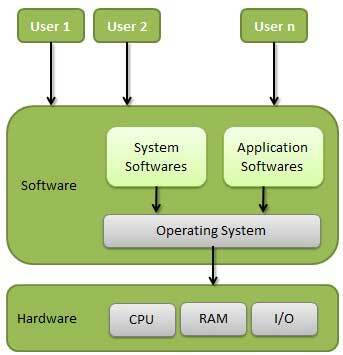 Multi-user operating system: The multi-user operating system allows concurrent access by multiple users of a computer. It allows many different users to take advantage of the computer resources simultaneously. It is often used in business and offices where different users need to access the same resources, but these resources cannot be installed on every system. We can classify the operating system on the basis user interface like command or character user interface operating system and graphical user interface operating system. CUI is a traditional user interface. It provides the interactive terminal where a user could enter the command to interpret. It was the only common place to communicate between a program and its user. Now a day also, we are using this command based interface. With the advancement of technology, the computer system has become quicker and cheaper. Operating environment has also changed. This lead the development of graphical user interface where users can interact with the computer using picture and graphs, rather than character and commands. It displays the icon, buttons, dialog box etc. Popular GUI is Microsoft Windows. The computer system is a collection of different hardware components. An OS is a collection of system program that together controls the operations of a computer system. Example: UNIX, MS-DOS, MS-Windows, Linux etc. in broad approach, we can classify the operating system on the basis user interface like command or character user interface operating system and graphical user interface operating system. CUI provides the interactive terminal where a user could enter the command to interpret. GUI consists of different components such as text box, icon, desktop, pointing devices etc. What is an operating system? Write any 3 functions. An operating system is an organized set of software program to manage the overall operation of the computer. To assist to execute application software. To control and coordinate hardware parts. To let the user run an application program. Differentiate between single-user operating system and multi-user operating system. 1. It allows a single user to perform just one task at a time. 1. It allows a multiple users to use programs simultaneously. 2. It does not support networking environment. 2. It supports networking environment. 3. E.g. MS-DOS etc. 3. E.g. Unix, Linux, etc. What is the different between CUI and GUI operating system? CUI operating system uses the character (text) to communicate whereas GUI operating system presents information in a graphical form to communicate. A collection of system program that together controls the operations of computer system is ______. What is the fullform of GUI? Which interface is based on command user interface mode and instructions are given using characters? Program that translates data that specifies network program use. Program that povides organized services. A connection between sender and receiver. What statement is true for Standalone OS? Program that provides organized services. None of answers are correct. Multi-user andime sharing operating system. Any Questions on 'Operating System '?